The Russian Internet, popularly known as the Runet, turns 20 today. RBTH takes a look at the projects, dynamism and global position of the country's biggest web players. Despite Russia’s recent economic slowdown, Internet firms have stood out as a bright spot with above-average growth. While the lion’s share of Russian equity offerings over the years has come from firms involved in natural resources, Russian tech companies are demanding an ever-growing share of the limelight. Russian technology firms are playing an increasing role in the economy, making them an important new source of equity as more Russians take to the Web. For example, take Yandex, which currently claims over 60% of the rapidly-expanding Russian search engine market compared with Google’s 26%. Yandex, which trades on the Nasdaq stock exchange, pulled in $1.3 billion from investors in 2011 in the biggest IPO for a dotcom since Google listed in 2004. Meanwhile, Russian social networking sites like Vkontakte and Odnoklassniki are so well established in their home market they present Facebook with a serious challenge. All this means Russian tech firms have been evolving into a rich source of fresh equity for capital markets in recent years, and are gearing up to sell more. Two of Russia’s biggest Internet firms, now traded only abroad, are considering listing shares domestically for the first time: search giant Yandex and the sprawling Web company, Mail.ru. Mail.ru began in 1998 as an email service — hence the name — but later evolved into a massive player in the Russian-language Internet. According to comScore, the American Internet analytics company, sites owned by Mail.ru collectively had the largest single audience in Russia in 2013, reaching 85% of Russian Internet users on a daily basis. 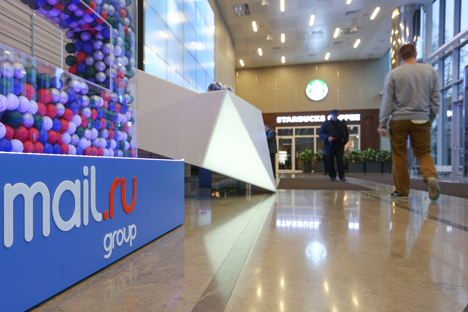 Mail.ru also owns a significant stake in Facebook, 15% of Russian digital payment provider Qiwi and 40% of the Russian social network, Vkontakte. In February the board of Mail.ru approved a plan to list shares in Russia, after the company reported that net profit jumped 36% in 2013 to 11.5 billion rubles. Mail.ru originally raised about $900 million during its IPO in November 2010 on the London Stock Exchange. Russian search provider Yandex said in February that full-year 2013 revenue had risen 37% to $1.2 billion, while adjusted net income rose 38% to $371 million. Yandex also successfully placed $600 million of convertible bonds at 1.125% in December. In 2013, Yandex overtook Microsoft’s Bing to become the world’s fourth most popular search engine, after Google, China’s Baidu and Yahoo, according to figures from comScore. “Our board is generally supportive of a [Moscow] listing,” Greg Abovsky, Yandex’s vice president of investor relations, said in February during a conference call for analysts, according to Reuters. No immediate timeframe has been given by the company for listing shares domestically. The total size of Russia’s Internet market is likely to increase at an average of 15-20% per year through 2018, according to a study conducted by the Russian Association for Electronic Communications and the Higher School of Economics. Among the most notable Russian IPOs last year were payment services provider Qiwi and software producer Luxoft. Qiwi operates a network of terminals, kiosks and “digital wallets” across the country. After debuting on the Nasdaq stock exchange in May 2013, Qiwi’s stock price more than tripled from $17 per American Depositary Receipt to as much as $59.24 last winter amid “buy” ratings by analysts and an expanding market for the company’s business. Yet the shares took a hit when the Russian parliament introduced a draft bill limiting the amount individuals can transfer online without providing personal information to 1,000 rubles (about $30). After retreating to the mid-$30s range, the stock recovered much of its lost territory, only to be sent back down to the same level in early March following the eruption of the Ukraine crisis. Russian software producer Luxoft went public in June 2013 on the New York Stock Exchange, after being established in 2000. Created to focus on the growing market for offshore software services in the U.S. and Europe, the company has since grown to 5,900 employees in 18 countries with clients ranging from Boeing to Goldman Sachs to IBM and Avaya.